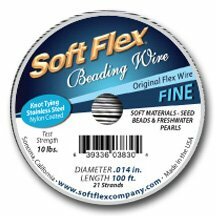 Soft Flex Beading Jewelry Wire This spool is stainless steel with a clear nylon coating. The second photo shows color. The color is original satin silver. The length is 100 feet (30.48m). The diameter is fine at .014 inches (.036cm). The number of strands is 21 which is a medium drape. The test strength is 10 lbs. Use with pearls and seed beads. Manufactures in the USA. If you have any questions about this product by Soft Flex, contact us by completing and submitting the form below. If you are looking for a specif part number, please include it with your message.